The subscribers to our newsletter, those who visit our website or are followers of GC36 on the social media will remember the solidarity in prayer that was created during the days before the days of the election of Fr. 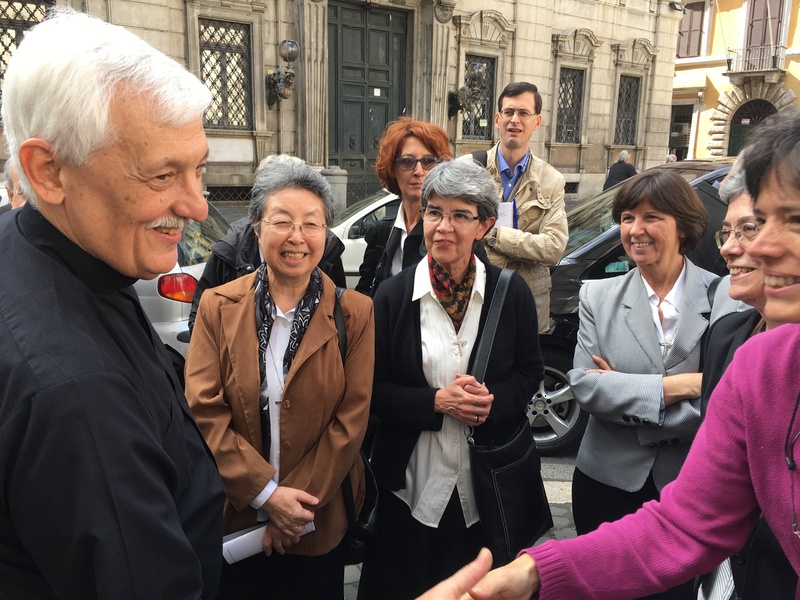 Arturo Sosa as Superior General of the Society of Jesus. The prayer “wave” did not stop with the publication of the result of the election. In fact, the communication office of the General Congregation has received a number of emails from people and groups who wanted to express their joy and to assure both the members of the Congregation and Father General of their prayers. Here is a sample of these testimonies. A lay woman from Pisa takes the opportunity of the election of the General to thank God for the presence of the Lord and his gifts to the Society of Jesus, as well as the presence of Jesuits in her life through the various works of the Society. An Indian Jesuit, working with JRS in Lebanon, manifested his union of spirit with the Congregation by writing a poem, inspired by the logo of GC36. Click here to read it and to meditate with it. As you can see in the picture of this article, the Mother General of the Esclavas del Sagrado Corazón and her counsel were with us during the Thanksgiving mass and shared a quick time of joy with Fr. Sosa at the Gesú. A CLC (CVX) community from France expressed his joy with a vibrant Alléluia! The jesuit community of Saint Ignacio at Paris, prepare for the Congregation a video on the prayer “Take Lord and Receive” for everybody to pray with the Congregation. See Video. The Mother General of the Missionary Ursulines of the Sacred Heart, an Ignatian religious congregation, stipulated that all the sisters were praying with the newly elected Father General in all the countries where they were involved: Italy, China, Australia, Japan, Philippines and Vietnam. Finally, here is an excerpt from a “special testimony” that was sent by the President of the St. Xavier’s College (Calcutta) Alumni Association. “More than 150 members of the Association met in the Indian city of Jaipur on 15 October 2016. The Conference began with the prayer where all members of SXCCAA and their spouses led by Rev. Fr. John Felix Raj, SJ, Principal, St. Xavier’s College, Kolkata, prayed for the new General of the Jesuit Order, Rev. Fr. Arturo Sosa, SJ, who was elected only on the previous day. The gathering also welcomed the new General with posters having the picture of the new General with a message of welcome to him from the St. Xavier’s Association, displayed prominently in the venue of the conference.